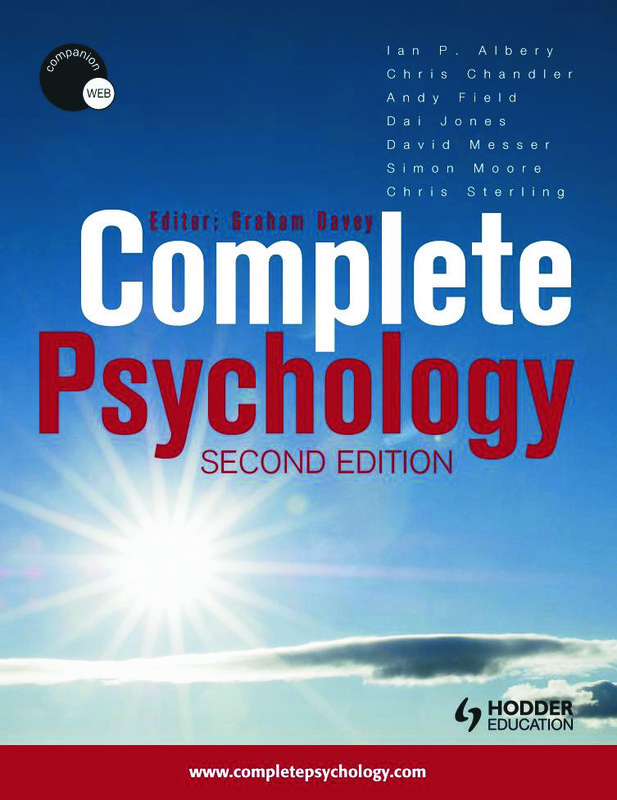 The new edition of Complete Psychology is the definitive undergraduate textbook. It not only fits exactly with the very latest BPS curriculum and offers integrated web support for students and lecturers, but it also includes guidance on study skills, research methods, statistics and careers. Complete Psychology provides excellent coverage of the major areas of study . Each chapter has been fully updated to reflect changes in the field and to include examples of psychology in applied settings, and further reading sections have been expanded. The companion website, www.completepsychology.co.uk, has also been fully revised and now contains chapter summaries, author pages, downloadable presentations, useful web links, multiple choice questions, essay questions and an electronic glossary. Written by an experienced and respected team of authors, this highly accessible, comprehensive text is illustrated in full colour, and quite simply covers everything students need for their first-year studies as well as being an invaluable reference and revision tool for second and third years. The present volume is a major enterprise, into which much work, and much information has been poured. It is ahead of it's time scholastically - state of the art research; colour coding helps retain critical information. This will be the leading introduction for British undergraduates in psychology for the next few decades. This text is a complete education in psychological science from a contemporary critical perspective, provocative and engages the reader to think critically about the application of psychological principles in everyday human behaviour and social interaction. "..Like the layout of the book…easy to find what you are looking for…easy to read." Graham Daveyis Professor of Psychology at the <?xml:namespace prefix = st1 ns = "urn:schemas-microsoft-com:office:smarttags" />University of Sussex. He is an experimental psychologist with research interests in clinical and abnormal psychology and learning theory. He has published over 100 research papers in scientific journals and has written and edited 10 books, including Phobias: A Handbook of Theory, Research and Treatment (1997) and Worrying: Perspectives on Theory, Assessment and Treatment (1994). He was President of the British Psychological Society from 2002-3.